Germán César Dima Departamento de Física, Facultad de Ciencias Exactas y Naturales, Universidad de Buenos Aires and IFIBA (CONICET), Pabellón 1, Cuidad Universitaria, 1428 Buenos Aires, Argentina. M. A. Goldin Unit de Neurosciences Information et Complexit, Cen- tre National de la Recherche Scientifique UPR-3293, 1 Avenue de la Terrasse, 91190 Gif-sur-Yvette, France. Gabriel B. Mindlin Departamento de Física, Facultad de Ciencias Exactas y Naturales, Universidad de Buenos Aires and IFIBA (CONICET), Pabellón 1, Cuidad Universitaria, 1428 Buenos Aires, Argentina. 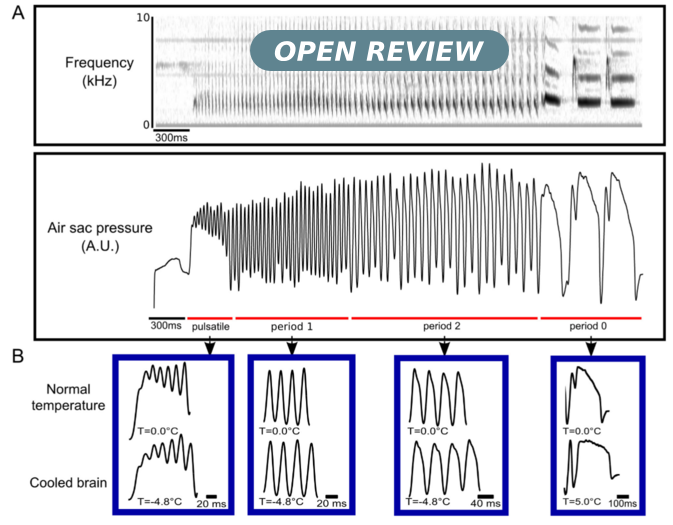 The nature of the neural mechanisms in the birdsong motor pathway that lead to the generation of respiratory patterns are a matter of extensive debate. In a top-down control paradigm, vocal gestures emerge from a unique timescale ruled by the telencephalic nucleus HVC, which engages other brain regions downstream. Another possibility is that the generation of motor instructions is distributed throughout the neural network, flowing both upstream and downstream. In this circular architecture, the song results from the integration of more than one timescale. In order to disambiguate these views, we used local focal cooling of HVC in canaries to manipulate the timescale present there. Within the frame of the circular model, we fitted the experimental pressure patterns of different types of syllables, which form a full song. We show that at least two separate timescales must be taken into account to reproduce them, one which is manipulated by cooling while the other remains unchanged. The modifications -stretching and breaking- of the syllables were quantitatively reproduced in this frame. This paper, by G C Dima, M A Goldin, G B Mindlin, is licensed under the Creative Commons Attribution License 4.0. All material published in this site is licenced under a Creative Commons Attribution 4.0 License.